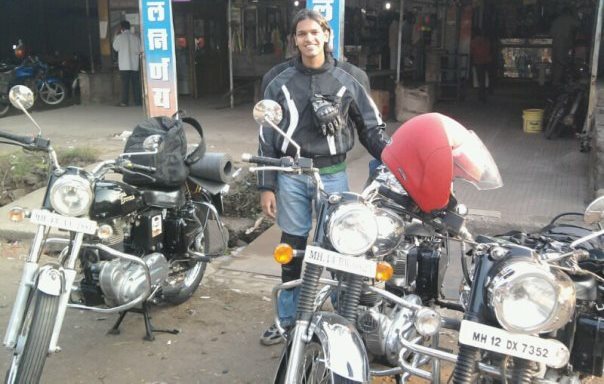 I did a tiny ride to konkan last weekend. Thot will update u all. I missed on the recent beat the heat ride. I was working that weekend. So last weekend we, me, Adnan(another thumper who wasn’t riding for almost one n half yr now) and his girl Avantika just decided to head out on weekend. We decided the route but destination wasn’t planned. We started on Saturday morning at 6 and headed towards Alibaug on my Mach 500 and his Std 350. We took a left just before Alibaug to Kurul and started riding along the coast towards down south. Its a narrow road which goes too bumpy at times, but its astonishingly scenic! The hill climbs, the cliffs and the never ending sea, the white sand beaches that u see while u ride r just awesome. We were riding right next to the beach all the time! We were relaxing at places we find worth taking a halt. Just for the fun sake we got our bikes loaded in a boat to cross the sea between Rajapuri to Dighi and rode further till Aaravi beach (a lil’ ahead of Diveagar). We came back to Velas beach and stayed at a place on the beach. The beach was practically empty except the three of us. Very clean and safe place. Amazing genuinely konakani food and great hospitality. We spent the night and Sunday first half at that place and rode back on the same route. We skipped the boat this time and rode via Mhasala. We stumbled upon an old black stone shrine just before Murud on our way back. It was a protected monument and was too good for an unexpected surprise. It was a 400kms ride in total. Way too good than what we were hoping for. M sure most of you would have explored this route already, those who haven’t should do it for sure. I would like to take this route till down south someday. Explore the whole Sagari Mahamarg. Lets plan it sometime guys.